Home Tags Posts tagged with "north korea nuclear program"
The latest UN sanctions imposed on North Korea have been described by Pyongyang as an “act of war”. A North Korea’s foreign ministry statement said the measures were tantamount to a total economic blockade, the official KCNA news agency reported. The statement added that strengthening North Korea’s deterrence was the only way to frustrate the US. On December 22, the UN Security Council imposed the new sanctions on North Korea in response to Pyongyang’s ballistic missile tests. The US-drafted resolution – unanimously backed by all 15 Security Council members – includes measures to cut North Korea’s petrol imports by up to 90%. Characteristically bellicose, North Korea described the latest UN sanctions “as a violent breach of our republic’s sovereignty and an act of war that destroys the peace and stability of the Korean peninsula and a wide region: “The United States, completely terrified at our accomplishment of the great historic cause of completing the state nuclear force, is getting more and more frenzied in the moves to impose the harshest-ever sanctions and pressure on our country. The US said it was seeking a diplomatic solution to the issue and drafted this new set of sanctions, including deliveries of petrol products will be capped at 500,000 barrels a year, and crude oil at four million barrels a year; all North Korean nationals working abroad will have to return home within 24 months under the proposals, restricting a vital source of foreign currency. There will also be a ban on exports of North Korean goods, such as machinery and electrical equipment. 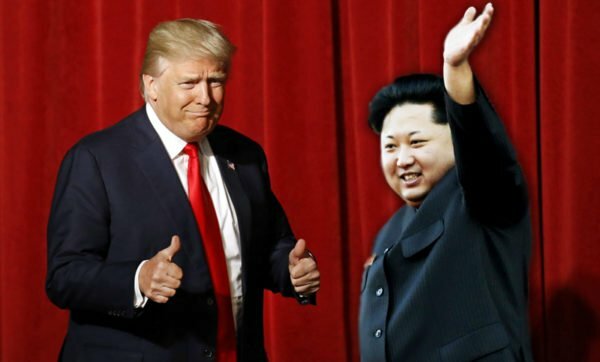 President Donald Trump has previously threatened to “totally destroy” North Korea if it launches a nuclear attack while North Korean leader Kim Jong-un has described the American president as “mentally deranged”. 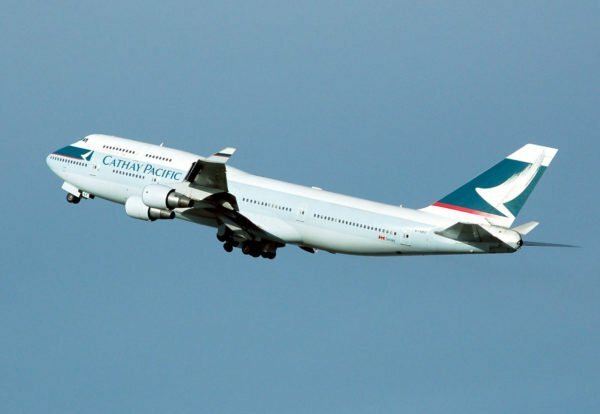 The crew of a Cathay Pacific flight from San Franscisco to Hong Kong flying over Japan reported a suspected sighting of last week’s North Korean missile test. 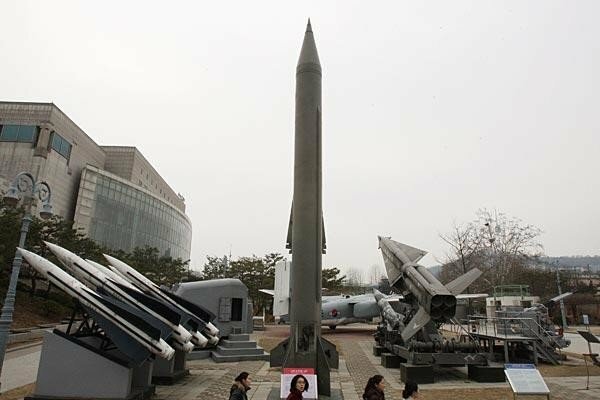 On November 29, North Korea launched a new intercontinental ballistic missile it said could reach anywhere in the US. The test-launch raised tension further with South Korea and the US, who on December 4 began their largest ever joint air exercise, which North Korea has branded an “all-out provocation”. Described by North Korea as its “most powerful” missile, the November 29 launch ended up in Japanese waters but flew higher than any other the North had previously tested. According to the South China Morning Post, Cathay Pacific’s general manager of operations Mark Hoey told staff in a message that “today the crew of CX893 reported, <<Be advised, we witnessed the DPRK missile blow up and fall apart near our current location>>”. 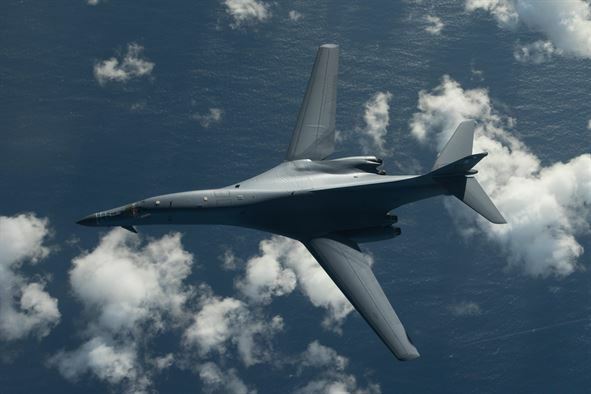 The launch was reportedly also witnessed by two South Korean aircraft en route to Seoul from the US. Unlike other countries, North Korea usually does not announce its missile tests which means they come without warning or known flight path, posing a potential risk to planes. North Korea does have access to international civil aviation data so it can study the airspace before any launch. While the risk of an incident remains very low, it is something that airlines are taking into consideration. In early August, Air France expanded their no-fly zone around North Korea after it transpired one of its planes flew close to a North Korean missile path. The December 4 air exercise between the US and South Korea, called Vigilant Ace, will last for five days. It will involve some 230 aircraft, including two dozen stealth jets, and tens of thousands of military personnel. North Korea has condemned the drills, saying over the weekend that the US was “begging for nuclear war” and that it would “seriously consider” counter-measures to the exercises. Hawaii has tested a nuclear attack warning siren for the first time since the end of the Cold War. The resumption of the monthly tests comes amid a growing threat from North Korea’s missile and nuclear program. North Korea has tested a series of ballistic missiles and in September carried out its sixth nuclear test. 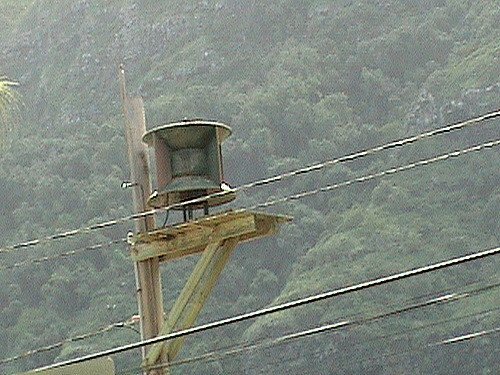 Hawaii already has a monthly test of sirens warning of natural disasters, including tsunamis. The nuclear attack signal uses a different, wavering tone, warning residents and tourists to stay indoors and await further instructions. The last time a nuclear attack warning siren was tested in the state was in the 1980s in the final years of the Cold War. However, it sounded again on December 1 and will be repeated on the first business day of every month. Vern Miyagi, the head of the Hawaii Emergency Management Agency, said it was “critically important” for the public to understand what the different tones mean, the Honolulu Star-Advertiser reported. A missile launched from North Korea could strike Hawaii within 20 minutes of launch, the publication added. Hawaii hosts the US military headquarters for the Asia-Pacific region. Pyongyang recently tested a new intercontinental ballistic missile which it claims can hit anywhere on the mainland United States. 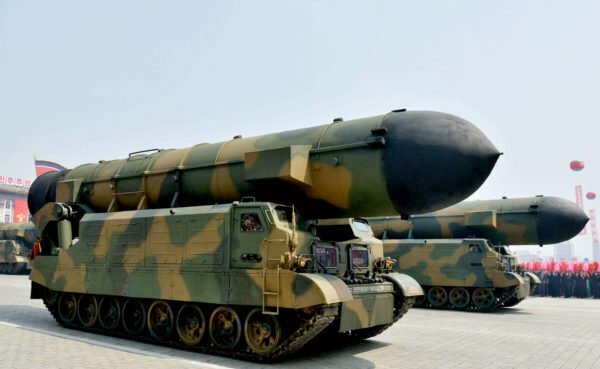 Experts say the Hwasong-15 appears capable of transporting a nuclear warhead, although it is unclear if North Korea is yet capable of making a weapon small enough to be fitted on to a missile. North Korea has launched a new ballistic missile, the latest in a series of launches that have raised tensions with its neighbors and the US. According to the Pentagon, it was an intercontinental ballistic missile that flew for about 620 miles and fell into the Sea of Japan. South Korean news agency Yonhap said that the missile was launched from Pyongsong, South Pyongan province. Pyongyang’s last ballistic missile test was in September. That came days after North Korea had conducted its sixth – and largest – nuclear test. The US said the latest launch happened at about 03:30 local time. Japan’s government said the missile travelled for about 50 minutes but did not fly over Japan, as some have done in the past. South Korea’s military said it had responded to the launch with a missile exercise of its own. North Korean officials said the first of the longer-range missiles it tested in July could hit “any part of the world”, but the US military called it an intermediate-range missile instead. Its last nuclear test reportedly involved a miniaturized hydrogen bomb that could be loaded on to a long-range missile, raising tensions with the US even further. 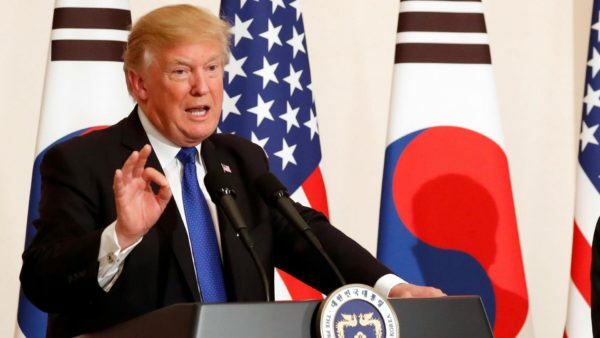 Last week, President Donald Trump announced that the US was re-designating North Korea a state sponsor of terrorism because of its missile and nuclear program. The US later imposed fresh sanctions against North Korea. The measures targeted North Korean shipping operations and Chinese companies that traded with Pyongyang. According to new reports, North Korean hackers have stolen a large cache of military documents from South Korea, including a plan to assassinate the country’s leader Kim Jong-un. South Korean lawmaker Rhee Cheol-hee said the information was from his country’s defense ministry. The compromised documents include wartime contingency plans drawn up by the United States and South Korea. The documents also include reports to the allies’ senior commanders. The South Korean defense ministry has so far refused to comment about the allegation. Plans for South Korea’s special forces were reportedly accessed, along with information on significant power plants and military facilities in the South. Rhee Cheol-hee belongs to South Korea’s ruling party, and sits on its parliament’s defense committee. He said some 235 Gb of military documents had been stolen from the Defense Integrated Data Centre, and that 80% of them have yet to be identified. The hack took place in September 2016. In May 2017, South Korea said a large amount of data had been stolen and that North Korea may have instigated the cyber attack – but gave no details of what was taken. According to South Korea’s Yonhap news agency, Seoul has been subject to a barrage of cyber attacks by its North Korea in recent years, with many targeting government websites and facilities. 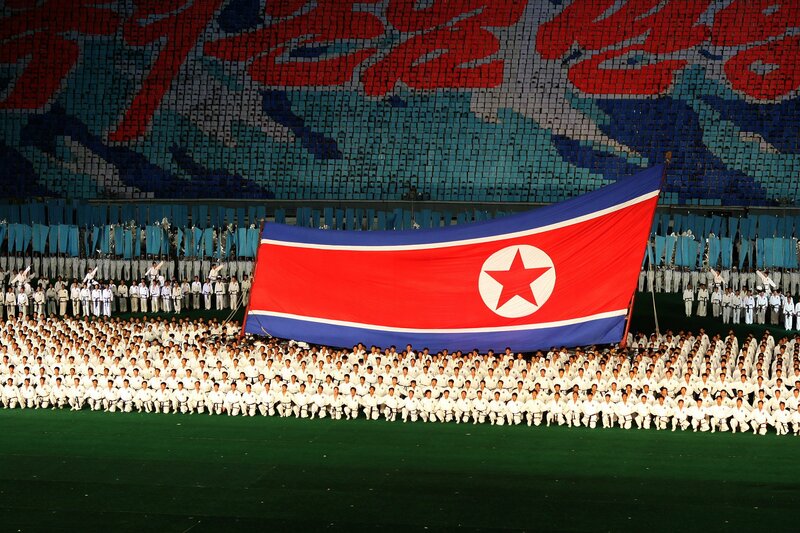 North Korea is believed to have specially-trained hackers based overseas, including in China. Pyonyang has accused South Korea of “fabricating” the claims. News that North Korea is likely to have accessed the Seoul-Washington plans for all-out war in the Koreas will do nothing to soothe tensions between the US and North Korea. The US and North Korea have been at verbal loggerheads over Pyongyang’s nuclear activities, with the US pressing for a halt to missile tests and the North vowing to continue them. North Korea recently claimed to have successfully tested a miniaturized hydrogen bomb, which could be loaded onto a long-range missile. In a speech at the UN last month, President Donald Trump threatened to destroy North Korea if it menaced the US or its allies, and said its leader “is on a suicide mission”. Kim Jong-un responded with a rare statement, vowing to “tame the mentally deranged US dotard with fire”. President Trump’s latest comment took the form of a cryptic tweet at the weekend, where he warned that “only one thing will work” in dealing with North Korea, after years of talks had proved fruitless. The president did not elaborate further. The Geneva-based group was formed in 2007 and inspired by a similar campaign to ban the use of landmines. As a coalition of hundreds of NGOs from across the world, they have highlighted the humanitarian risk of nuclear weapons. The group’s 10 years of advocacy helped pave the way for the introduction of a UN treaty banning the weapons, which was signed this year. While 122 countries backed the treaty, the talks were notably boycotted by the world’s nine known nuclear powers and the only NATO member to discuss it, the Netherlands, voted against. Tensions between President Donald Trump and North Korea have been mounting for several months over North Korea’s nuclear ambitions. President Trump is also threatening to withdraw from an agreement which monitors and limits Iran’s nuclear development. 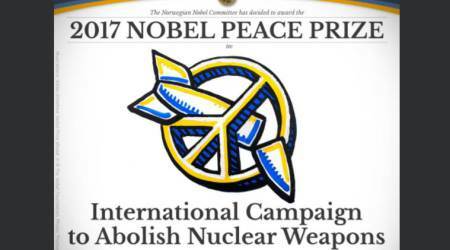 In a statement posted on Facebook, ICAN said the prize “shines a needed light on the path the ban treaty provides towards a world free of nuclear weapons”. “This is a time of great global tension, when fiery rhetoric could all too easily lead us, inexorably, to unspeakable horror,” the statement read. The number of nuclear weapons worldwide has been steadily decreasing since the 1980s, but none of the world’s nuclear powers have fully disarmed – an ambition set out in the 1970 Treaty on the Non-Proliferation of Nuclear Weapons (NPT). Nuclear armed nations boycotted the latest talks because they favor working within the NPT’s original framework to reduce stockpiles. Unlike the NPT, the 2017 treaty explicitly bans nuclear weapons. It calls for signatories not to develop, test or threaten to use the weapons. It also forbids nations from having weapons tactically stationed in their countries from allied partners. However, so far it has only been acceded to by 53 of the world’s countries including Cuba, Ireland and New Zealand. North Korea has fired a new ballistic missile over Japan, creating new tension in the region after its nuclear bomb test less than two weeks ago. According to South Korean military, the missile reached an altitude of about 770km (478 miles), travelling 3,700km before landing in the sea off Hokkaido. The missile flew higher and further than one fired over Japan late last month. South Korea responded within minutes by firing two ballistic missiles into the sea in a simulated strike on North Korea. Secretary of State Rex Tillerson also condemned the launch and the UN Security Council will meet later on September 15 in New York at the request of America and Japan. The launch took place from the Sunan airfield north of Pyongyang just before 07:00 local time, South Korea’s military says. 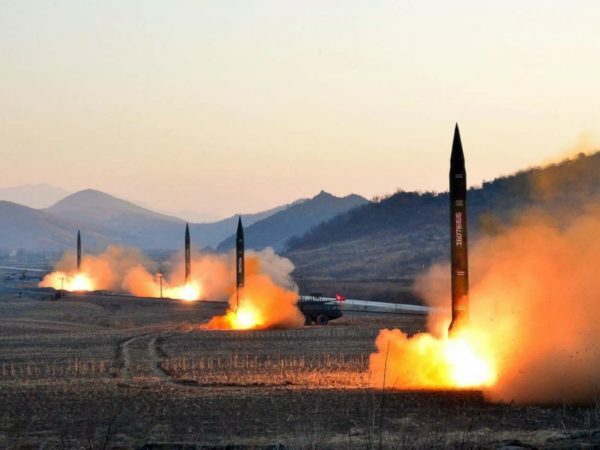 According to observers, it is likely to have been an intermediate range ballistic missile (IRBM) though Japanese officials believe there is still a possibility it was an intercontinental ballistic missile (ICBM). Sanctions on North Korea were tightened this week in response to its sixth nuclear test on 3 September, which reportedly involved a miniaturized hydrogen bomb that could be loaded on to a long-range missile. Only on September 11, the UN Security Council voted to restrict oil imports and ban textile exports, in an attempt to starve North Korea of fuel and income for its weapons programs. North Korea has launched a fiery attack on the US, threatening with the “greatest pain” it has ever suffered, following new sanctions imposed by the UN. 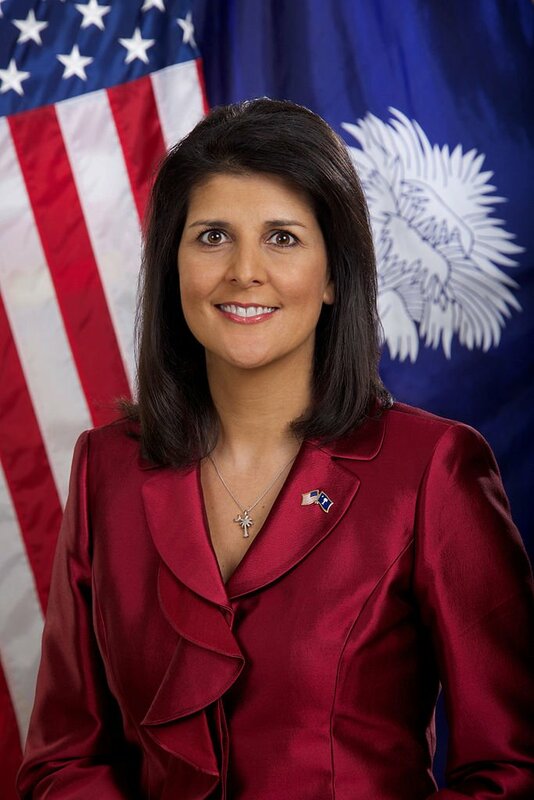 Its ambassador to the UN accused Washington of opting for “political, economic and military confrontation”. President Donald Trump said the move was nothing compared to what would have to happen to deal with North Korea. The UN sanctions are an attempt to starve the country of fuel and income for its weapons programs. The new measures restrict oil imports and ban textile exports, and were approved after North Korea’s sixth and largest nuclear test earlier this month. North Korea’s ambassador to the UN Han Tae Song said he “categorically rejected” what he called an “illegal resolution”. “The forthcoming measures by DPRK [the Democratic Republic of Korea] will make the US suffer the greatest pain it has ever experienced in its history,” he told a UN conference in Geneva. The UN resolution was only passed unanimously after North Korea’s allies Russia and China agreed to softer sanctions than those proposed by the US. The initial text included a total ban on oil imports, a measure seen by some analysts as potentially destabilizing for the North Korean regime. Limits on imports of crude oil and oil products. China, North Korea’s main economic ally, supplies most of the country’s crude oil. 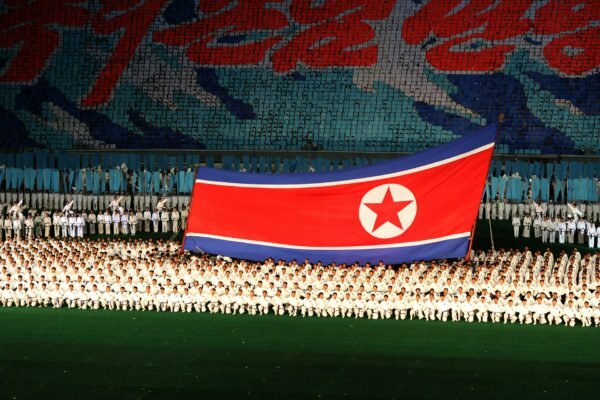 A ban on exports of textiles, which is Pyongyang’s second-biggest export worth more than $700 million a year. A ban on new visas for North Korean overseas workers, which the US estimates would eventually cut off $500 million of tax revenue per year. 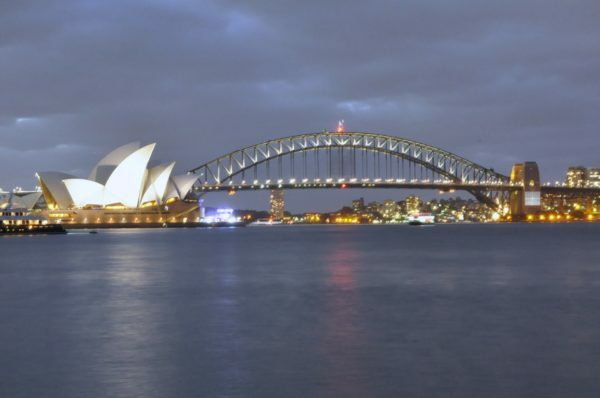 A proposed asset freeze and a travel ban on Kim Jong-un were dropped. “I don’t know if it has any impact, but certainly it was nice to get a 15 to nothing vote. But those sanctions are nothing compared to what ultimately will have to happen,” the president added, without giving details. “The North Korean regime has not yet passed the point of no return,” she added. The September 11 resolution against North Korea was the ninth one unanimously adopted by the UN since 2006. North Korea claims that it has successfully tested a nuclear weapon that could be loaded onto a long-range missile. Pyongyang said its sixth nuclear test was a “perfect success”, hours after seismologists had detected an earth tremor. North Korea said it had tested a hydrogen bomb – a device many times more powerful than an atomic bomb. Analysts say the claims should be treated with caution, but its nuclear capability is clearly advancing. Pyonyang last carried out a nuclear test in September 2016. It has defied UN sanctions and international pressure to develop nuclear weapons and to test missiles which could potentially reach the mainland US. According to South Korean officials, the latest test took place in Kilju County, where North Korea’s Punggye-ri nuclear test site is situated. The “artificial quake” was 9.8 times more powerful than the tremor from North Korea’s fifth test, the state weather agency said. It came hours after Pyongyang said it had miniaturized a hydrogen bomb for use on a long-range missile, and North Korean leader Kim Jong-un was pictured with what state media said was a new type of hydrogen bomb. State media said the device could be loaded on to a ballistic missile. Initial reports from the US Geological Survey put the tremor at 5.6-magnitude with a depth of 6 miles but this was later upgraded to 6.3-magnitude at 0 miles. This would make it North Korea’s most powerful nuclear test to date. Japan condemned the test and South Korean President Moon Jae-in convened emergency security council talks. In a report on September 3, North Korea’s state news agency KCNA said Kim Jong-un had visited scientists at the nuclear weapons institute and “guided the work for nuclear weaponization”. “He (Kim Jong-un) watched an H-bomb to be loaded into a new ICBM (intercontinental ballistic missile),” it added. 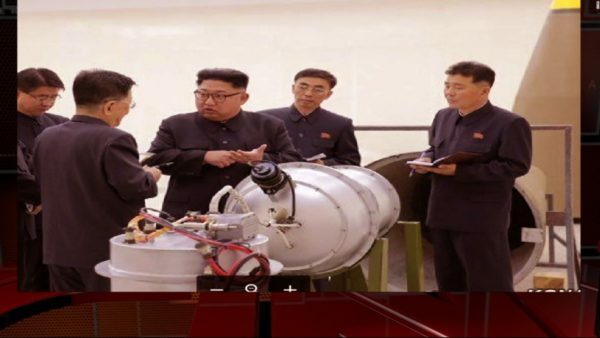 The report carried pictures of Kim Jong-un inspecting the device. It described the weapon as “a multi-functional thermonuclear nuke with great destructive power which can be detonated even at high altitudes”. International experts say North Korea has made advances in its nuclear weapons capabilities but it is unclear if it has successfully miniaturized a nuclear weapon it can load on to a missile. North Korea has previously claimed to have miniaturized a nuclear weapon but experts have cast doubt on this. There is also skepticism about North Korea’s claims to have developed a hydrogen bomb, which is more powerful than an atomic bomb. North Korea has fired a missile over northern Japan. Japanese PM Shinzo Abe called the move an “unprecedented” threat to his country. The missile, launched early on August 29, flew over Hokkaido Island before crashing into the sea. According to the South Korean military, the missile was fired eastward just before 06:00 local time from near Pyongyang – which is rare. Early analysis of the launch suggests the missile flew a distance of more than 1,680 miles and reached a maximum altitude of about 342 miles, lower than most previous North Korean tests. The missile was likely a Hwasong-12, a newly developed intermediate range weapon, and fell into the North Pacific Ocean 740 miles off the Japanese coast after breaking into three pieces. No effort was made by the Japanese to shoot down the missile but it issued a safety warning telling citizens in Hokkaido to take shelter in “a sturdy building or basement”. South Korea’s President Moon Jae-in ordered a show of “overwhelming” force in response to the launch. Four South Korean jets staged a live bombing drill on August 29. Japan’s PM Shinzo Abe said he had spoken to President Donald Trump and that both agreed to increase pressure on North Korea. Shinzo Abe said the North Korea’s “reckless action is an unprecedented, serious and a grave threat to our nation” which also “greatly damages regional peace and security”. The prime minister said his government was doing its utmost to protect people’s lives. North Korea’s conventional and nuclear weapons programs are a breach of international sanctions, so the test is being seen as a major provocation and an escalation of tensions on the Korean peninsula. 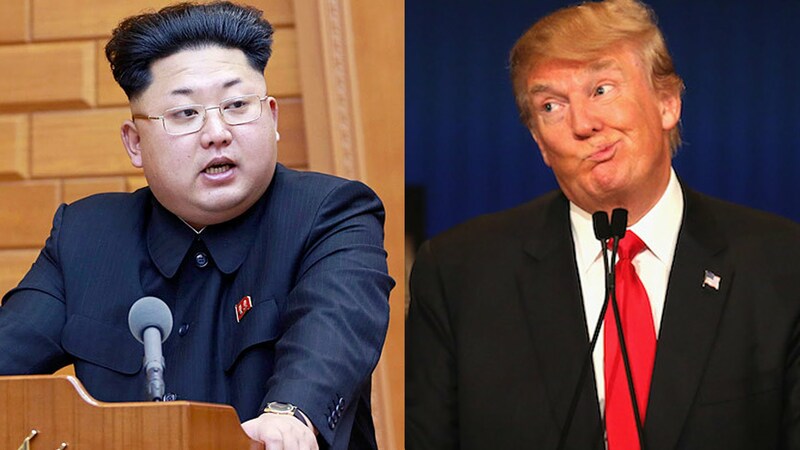 Earlier this month, North Korea threatened to fire missiles towards the US Pacific territory of Guam, while President Donald Trump warned Pyongyang would face “fire and fury” if it continued to threaten the US. There have also been some reports in recent months that North Korea is preparing to carry out its sixth nuclear test. However, last week, Secretary of State Rex Tillerson said the fact that North Korea had not carried out any missile launches since the UN imposed a fresh round of sanctions was an indication of restraint by Pyongyang. 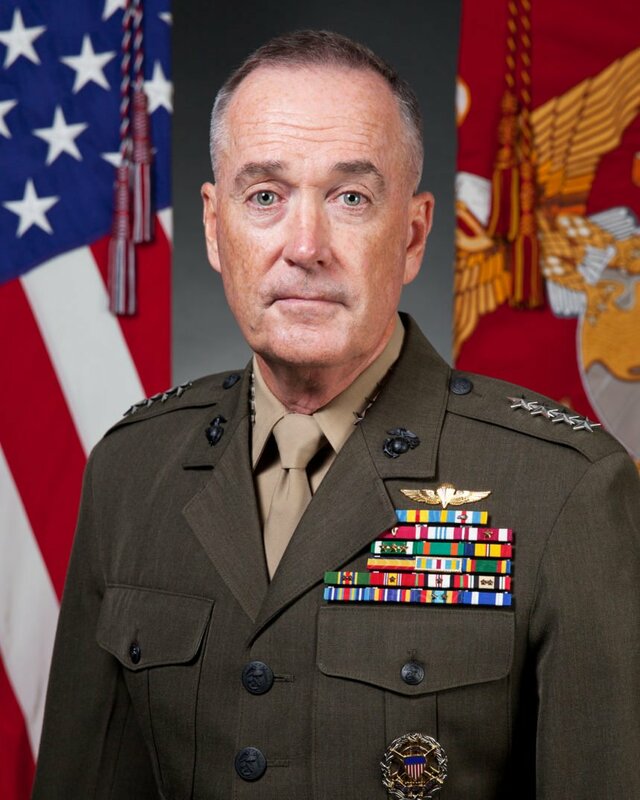 According to General Joseph Dunford, the top military adviser to President Donald Trump, a military response to North Korea would be “horrific” but remains an option. The US Joint Chiefs of Staff made the comments while visiting China. Gen. Joseph Dunford was responding to remarks by a top Trump aide ruling out military action over North Korea’s nuclear program. President Trump has warned North Korea that it faces “fire and fury”, while Pyongyang has threatened to strike the American territory of Guam. However, the sharp rhetoric of last week has since softened, with North Korea leader Kim Jong-un putting the Guam plans on hold – a move praised by President Trump. On August 16, White House Chief Strategist Steve Bannon said there could be no military solution to the stand-off. Gen. Dunford agreed a military solution would be “horrific” but went on to say “what’s unimaginable to me is not a military option”. He said President Trump “has told us to develop credible, viable military options, and that’s exactly what we’re doing”. A senior Chinese military official who met Gen. Joseph Dunford told him that military action should be ruled out and that “dialogue” was the only option, the Chinese defense ministry said. 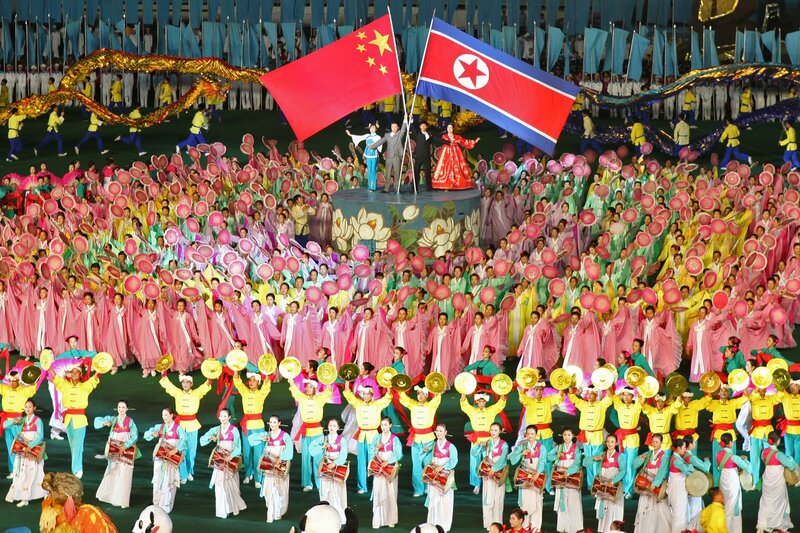 China is North Korea’s only major ally. The US has criticized China for not doing enough to rein it in, but Beijing says it has begun halting iron, iron ore and seafood imports from North Korea, in line with new UN sanctions. According to North Korean state media, supreme leader Kim Jong-un reviewed plans to fire missiles towards the US Pacific territory of Guam but will hold off. Although prepared for “the enveloping fire at Guam”, North Korea said it would watch what “the foolish Yankees” do before taking a decision. Last week’s threat against Guam escalated the sharp rhetoric being exchanged between the two sides. Meanwhile, South Korean President Moon Jae-in has urged the US not to launch an attack on the Korean peninsula without its consent, saying “no one may decide to take military action without the consent” of the South. 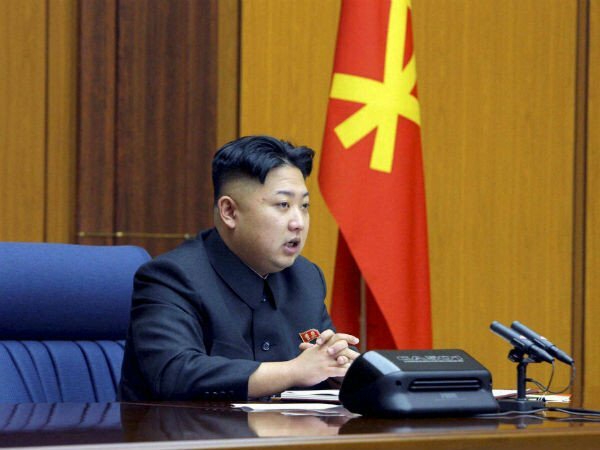 The KCNA report said Kim Jong-un “examined the plan for a long time” and discussed it with senior military officials. 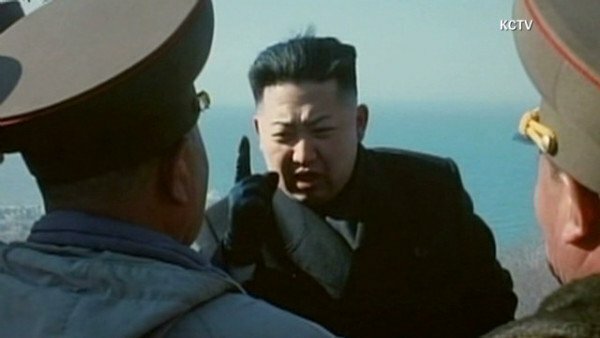 Kim Jong-un was now merely waiting for orders “after rounding off the preparations for the enveloping fire at Guam”. However, crucially, the report also said that Kim Jong-un would watch the US before making any decision, signaling an apparent deceleration in the provocative rhetoric. Correspondents say that after days of menacing threats it might seem that the North Korean leader could be in the mood to finally hit the pause button – but in a nation as secretive as North Korea, one can never be sure. Analysts say it could simply mean North Korea is not fully ready to launch an attack on Guam, so it could just be buying more time. South Korea and China – North Korea’s closest ally – have been urging calm and a renewed push for diplomatic resolutions. On August 15, South Korean President Moon Jae-in said the US should not act unilaterally. The two countries’ defense agreement states that they must “consult together” when either is threatened. On August 14, China’s foreign ministry reiterated its “suspension for suspension proposal” where North Korea stops its missile tests in exchange for a freeze on military exercises by the US and South Korea. He told reporters that the US military would defend the country “from any attack, at any time and from any quarter”. James Mattis also sought to reassure residents of Guam, home to US military bases and about 160,000 people, that they were well-protected and if a missile was fired, “we’ll take it out”.